The USA heads for 2019 in as much chaos as the UK though of a different variety – with a government shutdown, a White House administration in turmoil with an acting chief of staff, an acting secretary of defense, an acting attorney general, an acting EPA administrator, no interior secretary, and no ambassador to the United Nations. Plus former US allies outraged and bemused by Trump’s quixotic foreign policies. Legal jeopardy against Trump is mounting with four former colleagues pleading guilty to crimes; his campaign, his transition, his ‘charitable’ foundation and his business are all under investigation, never mind the NY Times expose of Trump, father and siblings engaging in a years-long scheme to commit tax fraud on a massive scale; and his elusive tax returns still have a tale to tell. The stock markets are tanking and the global economy is running into trouble. Trump inherited ‘the best performing economy on the planet’ and gave it another stimulus with borrowed money. But export markets are in trouble; Europe and China’s economies are slowing, with Trump’s trade worries adding to the strain. American consumers don’t have the spending power to come to the rescue having been hit with additional healthcare, housing and education costs, as well as increased tariffs on goods. While the wealthy get wealthier and the US debt grows. The USA 1776 chart shows up a sharp reality-check from as early as mid January as tr Saturn opposes the Cancer Sun (repeating in September). What will make that experience starker will be the 6th January Capricorn Solar Eclipse in opposition to the USA Sun ramming home the message that mistakes have been made and, if crises are to be averted in the months ahead, a new approach will be needed. It will be an ego-deflating time as the national psyche ponders on the consequences of having got it wrong. Not that the challenge of eclipses are always risen to. Many times they are ducked and crises follow to force a rethink that would have been better done earlier. 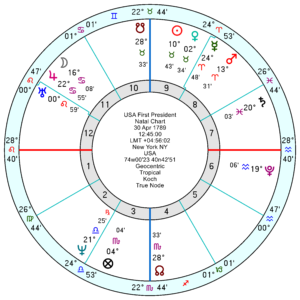 From mid February for a month, and repeating on and off till late 2020, tr Pluto will trine the USA Neptune which will bring confusion even devastation and off-the-wall ideas. The July Eclipses will have the strongest effect as the Solar Eclipse in Cancer is conjunct the USA Sun is likely to accompany crises which will prompt radical decisions about the path ahead; and the Lunar Eclipse sits on top of the USA fanatical Mercury opposition Pluto which will foster hostility and heated debates. In many ways 2019 is only the gathering storm with 2020 being a more critical year with the panicky-failure tr Neptune square the USA Mars; and tr Pluto moving to oppose the USA Mercury for even more inflamed debates in 2020/21 – and the era-ending Pluto Return following from 2023 onwards for two years. 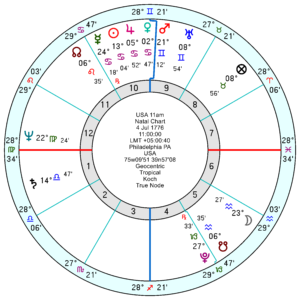 The USA First President chart, 30 April 1789 12.45pm New York, reflects similar energies with tr Saturn square the Mars for financial setbacks; tr Pluto square Neptune bringing more chaos; and the Eclipses in January and July stirring up the electorate as they hard aspect the Cancer Moon. 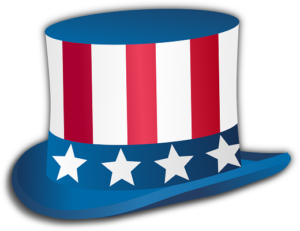 Trump is unlikely to change his ways, but is under increasing pressure from mid February onwards, escalating from late March as tr Pluto makes a discouraging square to his Saturn (on and off till late 2020) – during this phase as well his relationship chart with the USA is showing up more obvious dislike and aggravation about his governance and that also runs till late 2020. His Progressed Moon trudging unhappily through his 12th house, never an encouraging experience, will conjunct his Mars in April for what might be an even more dramatic tantrum than usual. Tr Neptune squares his Uranus from late March through April, which could send his already mental balance/grasp on reality even further off kilter. That repeats into early 2020. 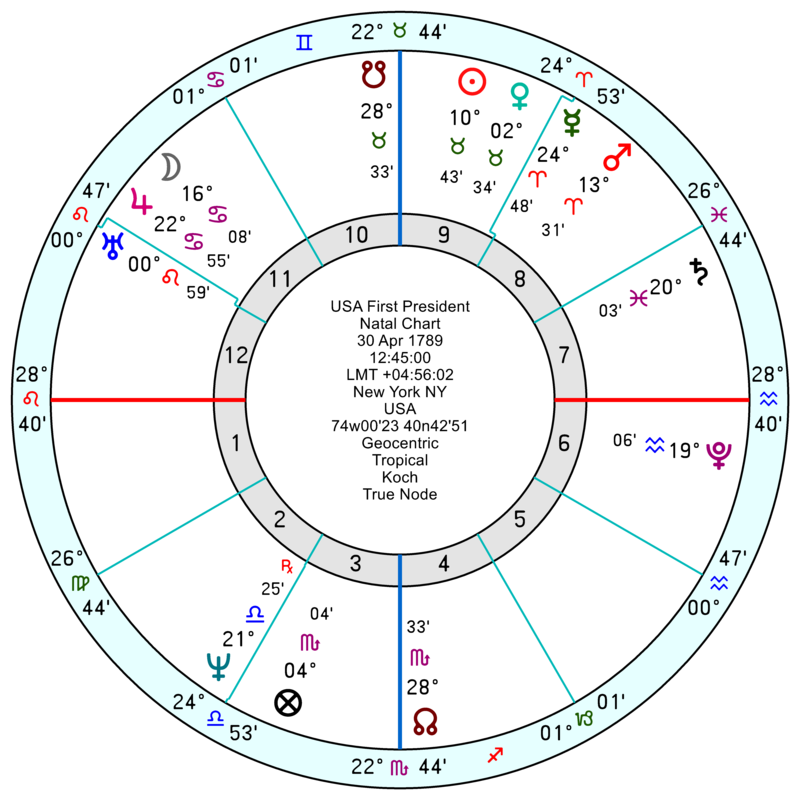 His Term chart will be rattled in March with tr Uranus square the Sun, sagging with disappointment and unpopularity in April, but generally will be in a bullish, what-the-hell mood throughout into 2020. Early 2020 will be the most unstable phase. AndyB: Either way, tr. Neptune in Pisces will be applying a square to the US Mars in Gemini, which is usually diffcult for the economy or for developing political consensus. It can be warlike. That transit will linger through 2022. And the U.S. Pluto return will be exact for the first time in 2022 and 2022 is a mid-term election year. The astrological chart for the USA (Sibily chart) has always shown a propensity for a financial crisis around this period. The eclipses this year (January, July, and December) are largely centered along the 2nd/8th house axis of its chart, and we can also find the tr. North Node in Cancer in the 8th this year. The 1/6/19 eclipse is centered right in between Saturn and Pluto in Capricorn. This will serve to powerfully usher in the energies of that conjunction. Saturn moving into the US 2nd house, moving closer to its conjunction with Pluto, will step up the downward pressure on the market really from this point onwards. This market was fueled by cheap borrowings and stock buybacks. The central bank kept interest rates near zero, and engaged in quantitative easing to support asset values. With this stimulus ending, prices are going to readjust, and it is going to be a painful process that will be getting under way in 2019 and continuing through the early part of the next decade. The party is over. Interesting that you pointed out tr. Pluto in Capricorn trining the US Neptune in Virgo in 2020. tr. Jupiter in Capricorn will be conjunct tr. Pluto, which will be applying a trine to the US natal Neptune in the 9th house during the middle to later part of that year. In spite of some very heavy transits, this aspect could suggest either a period of massive liquidity support for the economy, in a last ditch attempt to support debt laden corporations (Capricorn), or it could suggest a broader debt reset. Given that it affects the US 9th house, it might suggest some type of broader international effort for debt relief or diplomacy. Or it could be a conflict, given the other highly charged transits around that time. Either way, tr. Neptune in Pisces will be applying a square to the US Mars in Gemini, which is usually difficult for the economy or for developing political consensus. It can be warlike. That transit will linger through 2022. So many possibilities of how it this will play out. It will be very interesting to see how things materialize. I’m feeling truly awful for all the families of Federal employees going without a pay in The US these days. As well as the the little boy Trump told believing in Santa is marginal at his age. And we wonder about T-rump’s fascination with coal. He has an entire coal mine filling his stocking. Kid will vote vegan the next election and will work to ban Cheeseburger Happy Meals from McD’s. Merry Christmas Marjorie and many thanks for all your wonderful and interesting posts. Another Yule fruitcake to pass around to next year.